In Mark Twain’s “The Adventures of Tom Sawyer,” although little Tom’s thankless job of whitewashing the fence is an unpleasant punishment, yet, it is his ingenious manner of making the work irresistibly attractive that makes his initially reluctant friends finally beg and plead him to hand over the same task to them. 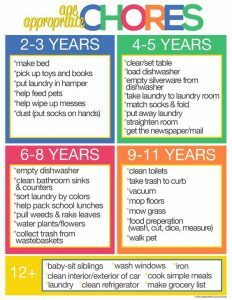 Kids normally get spurred up to do such chores that appeal to them and that they find interesting. Your kid may turn a deaf ear to all your requests, commands, accusations and warnings to do a particular chore and finally after consistent yelling, you may at times momentarily triumph in having the chore done. But, dear moms, there are other ways too to bell your stubborn cat. Let’s find out. Start early with toddler chores: According to psychologists, babies as small as eighteen months old, develop a natural urge to help parents in doing family chores. And, it is only through an effective guidance that such inclinations later materialize into a noble virtue. So, next time you observe your fumbling toddler desperately trying to help put aside groceries, encourage him enthusiastically. Fix a chore deadline: Your smart boy may purposefully delay in cleaning the toilet and keep on postponing the tedious task for an indefinite future time. Set a definite time limit and provide copious motivations such as, “Let’s see whether you can do this faster than me,” so that along with the time constraint to accomplish the job, a competitive spirit is kindled to excel. Generously appreciate and involve rewards: Don’t you turn radiant on being praised by your husband or boss? Well, kids too get charged upon hearing kind words. A proper appraisal of their effort fosters the necessary motivation to move ahead and accept more responsibilities without hesitation. So gently cheer him up when he eagerly volunteers to clean father’s room, and you may at times reward him too. Cultivate the habit as a routine: Consciously strive to develop his duty of doing chores as a routine such that it gets ingrained in him and he does chores irrespective of your indulgence. Have fun chores: Most of the time, monotonous lectures about the importance of doing daily chores or open reminders concerning a chore undone do not work. Hence, try experimenting with the means of discharging domestic chores. For instance, if your son forgets to wash his favorite coffee mug, remove it and leave a note saying, “You missed your chore and if you want to earn it back, quickly wash the dishes and grab your cup.” It will not only add fun and variety but also teach him the valuable lesson of the consequence of leaving things undone. Organize a treasure hunt such that if your son wishes to find his mobile, he stumbles upon a set of clue cards (set by you), with each pointing towards a chore to be accomplished so as to retrieve his object. Get hold of the online game, Chore Wars that attempts to make the whole process of doing chores more exciting through role playing. Cover up all four sides of a little cube with white or paper, and on each, write down the chore you want your kid to do. Now indulge in a game of rolling the cube between you and your kid, to finally decide upon which particular chore is destined for him and which one is for you. Initiating kids to do chores at home helps them in becoming disciplined and responsible individuals, who know how to tackle the rough challenges of life. It also generates in them the feeling that they are valuable contributors to the family. You definitely wouldn’t wish to see such days when maybe you are ill, and your messy, grown up son is at a loss to brew even a cup of tea! So, try evolving the whole process of doing chores into something inspiring and creative such that it becomes an indispensable reality of life.